Absolute rotary encoders measure actual position by generating a stream of unique digital codes (instead of pulses) that represent the encoder's actual position. Single turn absolute encoders output codes that are repeated every full revolution and do not output data to indicate how many revolutions have been made. 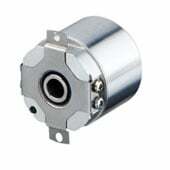 Multi-turn absolute encoders output a unique code for each shaft position through every rotation, up to 4,096 revolutions. 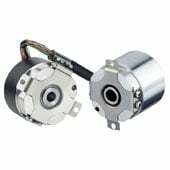 Unlike incremental encoders, absolute encoders will retain correct position even if power fails without homing at startup. 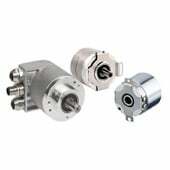 View all shafted absolute encoders that can be mounted with a coupling to a motor or driven shaft. 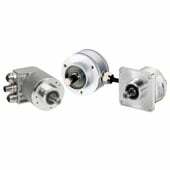 Single and multi-turn encoders available. 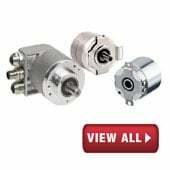 Dynapar offers a wide range of hub-shaft absolute encoders with bore sizes of 0.25 to 0.5 inches and several tether options available. 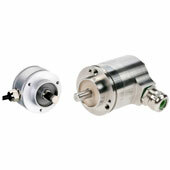 See all hollow-shaft absolute encoders for mounting directly to a motor shaft. Up to 22 bit single and 12 bit multi-turn available. 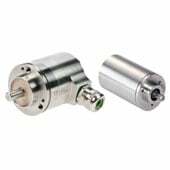 Dynapar offers reliable optical absolute encoders with high resolution for applications requiring precision feedback. Magnetic absolute encoders provide precise feedback even in tough environments where dust, dirt and contaminants are common place. Dynapar offers hazardous area rated absolute encoders for applications requiring explosion proof or intrinsically safe encoders.